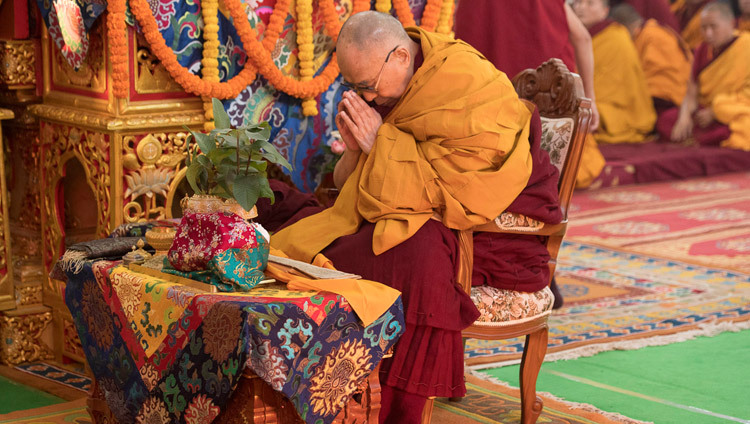 Bodhgaya, Bihar, India – Arriving at the Kalachakra Maidan early this morning, His Holiness the Dalai Lama first of all took a seat next to the teaching throne, facing in the opposite direction towards the pavilion containing the Avalokiteshvara mandala. For more than half an hour he undertook the preliminary procedures to prepare himself to begin to grant an Avalokiteshvara empowerment later in the morning. Once they were complete he sat on the throne. A group of Mongolian monks gave a stirring recitation of the ‘Heart Sutra’ in their native language. When they were finished most of them offered His Holiness the sapphire blue silk scarves favoured by Mongolians. They were followed by a mixed group of Japanese who chanted the ‘Heart Sutra’ again in Japanese to the rhythmic accompaniment of a ‘mokugyo’ – a wooden fish bell. Elderly monks of Namgyal Monastery offered the mandala and the threefold representation of the Buddha’s body, speech and mind. “First we’ll read the ‘Thirty-seven Practices of Bodhisattvas’, His Holiness announced. “Because the author Togme Sangpo lived at the Ngulchu Hermitage, Ngulchu was added to his name. He was also referred to as ‘Gyalsay’, which means ‘son of the conquerors’, to indicate that he was a bodhisattva. One of his contemporaries was Buton Rinchen Drub who had pains in his arms and asked Togme Sangpo, as a bodhisattva, to blow on them in blessing. He apparently experienced some relief as a result. Verses 15 and 16 correspond to the ‘Eight Verses for Training the Mind’ and verses 18 and 19 counter pride. From verse 25 the author explains the six perfections—generosity, ethics, patience, effort, concentration and wisdom. His Holiness drew attention to the first lines of verse 36, ‘whatever you are doing, ask yourself, “What’s the state of my mind?” He observed that Togme Sangpo’s text is very useful for people otherwise swayed by anger and attachment. Telling the audience that monks of Dzongkar Chödey had asked him to give the transmission of a text he had written called the ‘Inseparability of the Spiritual Master and Avalokiteshvara’, His Holiness read it. He pointed out that some understanding of emptiness is essential before engaging in the practice of tantra. He mentioned that emptiness was explicitly taught during the second turning of the wheel of dharma, which deals with the object clear light. During the third turning of the wheel, in the Tathagata-garbha or Buddha Nature Sutra, he taught about the subjective clear light of the mind. He noted that all states of mind have a basis of clarity and awareness and that both object clear light and subjective clear light are employed in Highest Yoga Tantra. He remarked that object clear light corresponds to emptiness of intrinsic existence, emptiness of self (rang-tong), while the subjective clear light of the mind is empty of other (shen-tong). His Holiness then read from the same booklet a sadhana and a prayer to Avalokiteshvara to guide practitioners from life to life. Following Nagarjuna’s definition of the fourfold sangha as consisting of fully ordained monks and nuns as well as lay men and women holding precepts, His Holiness offered to give lay person’s precepts to those who wished to take them. He followed this with the granting of bodhisattva vows following the style and ceremony described in Asanga’s text, ‘Bodhisattva Grounds’. 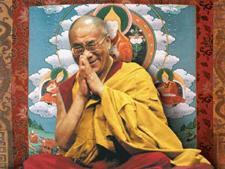 His Holiness recalled receiving bodhisattva vows, which he now renews daily, from Ling Rinpoche here in Bodhgaya. Prior to that ceremony Ling Rinpoche had taken them afresh before the statue of the Buddha inside the Mahabodhi Stupa. His Holiness then proceeded to go through the preparatory procedures for the Avalokiteshvara empowerment that he will give tomorrow. This included distribution of ‘protection cords’ and pieces of purifying kusha grass. Reminding his audience that the appearance of the Buddha and his teaching is as rare as an udumbara flower, His Holiness urged them to rejoice that they had been able to hear apt instructions, and to take the lay person’s vows, bodhisattva vows, as well as the preliminaries for the Avalokiteshvara empowerment. As he climbed into the car to return to the Tibetan Temple, His Holiness turned to wave to the crowd that had apparently been transformed into a field of kusha grass.